This morning the eggs began to hatch at the Cathedral of Learning but as the first one opened its egg the mother peregrine, Hope, killed and ate the chick. Fortunately she had her back turned while she ate. There were four eggs when the day began. It remains to be seen how many will survive. Don’t watch the eggs hatch at the Cathedral of Learning if it upsets you to see a mother kill her young. I’ll let you know when the coast is clear. Update: At approximately 9:00am Hope killed and ate chick#2. Though this situation resembles reality TV in which viewers can vote someone on or off the island, it is not a “voting” situation. If commenters become worked up and demand/request action in emails or phone calls to “those in charge” it will end the show. Literally. It will shut down the camera. That’s what happened when commenters went over the top at the Woods Hole Osprey-cam. Normally I do not edit readers’ comments but this situation is not normal. If you post a comment that could inflame others, I will edit it or delete it. Though I am not watching Hope closely (I don’t want see her kill her young), I do want the camera to stay up. Oh dear, Hope is true to form so this is her normal. Thank you, Kate, for the head’s up. No watching from me until I hear from you that the coast is clear. People shouldn’t anthropomorphize wild animals. They kill their young frequently, especially when they cannot find food. It’s only a bird and doesn’t weigh any moral implications beforehand. 2nd egg hatched @ 9 am and Hope did the same thing. Its so sad and peculiar. She takes such good care of the eggs too. Where is Terzo? does she do this because Terzo isn’t bringing food?? Laura, we don’t know why she does this. We have no idea though there are plenty of theories. My thought is that she ate some of the lead paint from the bridge she was originally living in and it affected her brain. Since those who study falcons find her behavior extreme and not normally found in falcon studies, the lead poisoning could be a thought. I’ll wait for the “all clear”. Kate, I was so hoping this would be a good year. Sadly it is not. I can’help but feel Mother Nature won’t give us the answer as to why she does this . I watch other site &.have never heard of this elsewhere. What else can we say?thanks for keeping us up on the status..
Oh dear. Hoping for a better outcome for the final two. What’s the evolutionary perspective on this? Does she know how many offspring she feels confident of caring for (“Hope does this every year”)? I know it’s unsavory to us, but there must be a reason for her instinct to do this. This bird is truly nuts. How she takes such care of the eggs then kills them. Maybe she just doesn’t want a big family to take care of or she thinks something is wrong with the chick???? She knows what an egg is and what a chick is, obviously, but she doesn’t seem to understand that the hatching process is part of it? The activity of hatching possibly looks like the activity of prey to her? Perhaps it stimulates a portion of her brain that is repressed in normal peregrines? Did she eat #3? … Actually I believe I’m wrong. I just saw 2 eggs under her yet. She must have been eating up the shell from the others. Thank you Kate, I have chosen not to watch until the hatching drama is over. I do think someone should tell Terzo that he would be much more “successful in passing on his genes” if he found a different mate! He is such a handsome tiercel! ? Hopefully last two will be ok and survive. She is such a beautiful bird and it is sad to wonder what makes her do this. Helps to watch other nests where tragedy is not a yearly occurrence. Haven’t watched much this year. Still have hope for this nest. One of the best locations to raise chicks if they can get through first few days. Goodness, Hope. I would advise everyone to tune into some other successful nests as I have done. I live in California so I’ve been watching the nest in San Francisco on top of the PG&E building. Three little, thriving babies there! Also, there’s a nest on San Jose City Hall with parents who routinely bring ducks for breakfast!! REPLY FROM KATE ST.JOHN: Actually I think it’s alive. Look again. Hope has another baby . 3rd egg hatched. Terzo was on eggs. Hope came back, picked at an egg shell and 3rd chick a little. Then dragged chick under her and sat on the last egg. Chick was alive. 1:30ish pm. Just saw the hatching of third egg. All is fine. One more to go. Hope returned around 1:35 or so and Terzo left – I could see the chick and at first I thought she was consuming it, but it was the shell that she was eating. She pulled the chick toward the remaining egg and settled down on both. This chick seems to be a keeper. I hope the last one is too. Fate of the 4th one might depend upon who is sitting on it when it hatches – Hope or Terzo. Third chick likely survived because Terzo was sitting on it when it hatched. Got a peek at 3rd chick. Looks so cute and healthy. First feeding will be a great sign. Fingers crossed for 4th egg and a successful hatch. If both of them can get through next few days, they have a good chance of growing up to be beautiful falcons. Both mom and dad are gorgeous. Saw movement of 3rd chick when she raised up slightly @ 2:38 PM. Kate, so glad I’ve listened to your advice and have been reading your updates rather than watching in real time. It’s still awfully hard to accept. Thank you for all you do. Thank you so much for keeping us updated on what is happening at the nest. I looked in around 8:00 this morning and saw what was going on and decided not to watch for awhile. I’ve been checking back here for updates and just wanted to say thank you and let you know that they are very much appreciated. I watch this cam all year long and was hoping this wasn’t going to be a repeat of the last two years, but I realize that this is the way it’s going to be. As much as we don’t like it, we are just going to have to accept it. I do enjoy watching Hope and Terzo and am looking forward to watching them raise their chick(s). I’ll check back in on the cam after I find out what happens to the fourth egg. Until then I will keep checking back here. Thanks again. I like this camera very much and I also enjoy the camera for the falcons at the du Bois library at the University of Massachusetts–Amherst. That camera is not live yet this year, but ,as I thought I remembered, in 2017 the pair had four eggs. One disappeared (it is not known how) and the female was seen to eat the next egg. Two others hatched as expected and fledged successfully. As it becomes possible to see even more nests, perhaps we’ll find this is not an isolated event? But I wonder if it will ever be explained. One live chick & one egg still to go, 5:16 PM. My theory is brood reduction but that doesn’t explain why she sacrifices the early hatches and not wait for all. Strange bird. Maybe we should change Hope’s name to Medea. There’s no need to post my message. I’m just venting because it upsets me. And, when I say I wish she was gone, I mean I wish she’d go elsewhere where banding isn’t done. I don’t wish her any harm or expect any human intervention. Perhaps another female will arrive and challenge her for the nest site. So happy to see the third chick under Hope! Have been watching with caution, now watching with “Hope”!!! Do they bring food to the nest like Eagles? I haven’t seen much food there… but it’s not as easy to watch… refreshing the page. 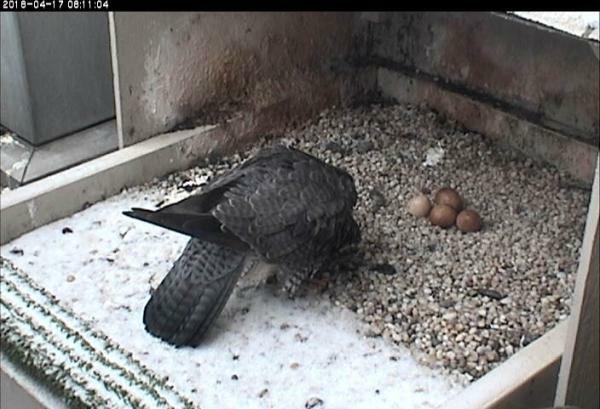 ….and is 4 eggs a lot for a Falcon? 4 eggs are normal. … The chick was fed at 5pm.